The Denver Post/RJ SangostiSmoke from the fire could be seen from as far away as west Arvada. 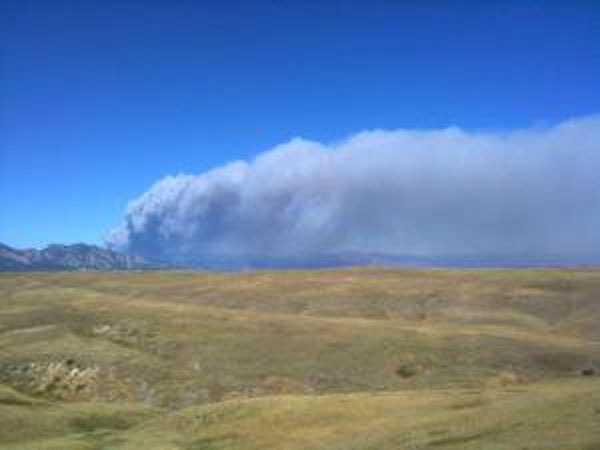 DENVER – A wind-driven wildfire broke out in the rugged Colorado foothills and quickly spread across 4 square miles Monday, destroying some homes and triggering evacuations of hundreds of others. No injuries were reported. Authorities could not say how many structures burned down, but they said at least some of them were houses. The fire started in Four Mile Canyon northwest of Boulder, and erratic winds gusting to 45 mph spread the flames both to the west and northeast. At least four roads in the area were closed, and a billowing, white plume of heavy smoke was visible for miles. County health officials advised residents to stay indoors if the smoky air became irritating. Boulder County sheriff’s Cmdr. Rick Brough said the fire moved quickly through difficult country. “It’s very rocky, hilly, mountainous terrain,” he said. About 200 homes scattered in and near the canyon were evacuated earlier in the day. Authorities said residents of seven other subdivisions were ordered to evacuate by Monday night. They included at least 200 additional homes, but the total wasn’t immediately known. The Boulder County Emergency Management Office website said the county’s telephone alert system wasn’t working properly and advised residents in the evacuation areas to leave rather than waiting for a call from authorities. It wasn’t clear whether authorities were going door-to-door. No one answered the main number at the Emergency Management Office Monday night. At least 100 buildings were threatened. One fire vehicle was destroyed, said Patrick von Keyserling, a spokesman for the Boulder County Office of Emergency Management. About 100 ground crew members were on the scene and 75 more were on standby, Brough said. Late in the day, winds subsided enough that two aerial tankers were able to begin dropping fire retardant shortly before 6 p.m.
Three evacuation centers were set up in Boulder and in the mountain village of Nederland, and at least 65 people had checked in at the three centers by mid-afternoon. A shelter for livestock was set up at the Boulder County Fairgrounds in Longmont.